Hello and happy Monday everyone! It's a great day to start a Blog Hop with Scrapbook Adhesives, creators of reliable and easy-to-use adhesives perfect not only for scrapbooking, but also card making, mixed media, home decor and more. Everything from permanent adhesive for archival use, 3D foam for dimension, and repositionable adhesive for multi uses. They've got it ALL covered! 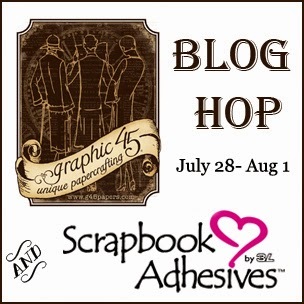 Today you can hop along the fabulous designers' blogs listed below to see their creations using Scrapbook Adhesives products, then stay tuned to the Graphic 45 blog for the rest of this week's featured artists and their wonderful projects. You're sure to be inspired and you may learn something new about Scrapbook Adhesives' product line. Graphic 45 blog for prize details! 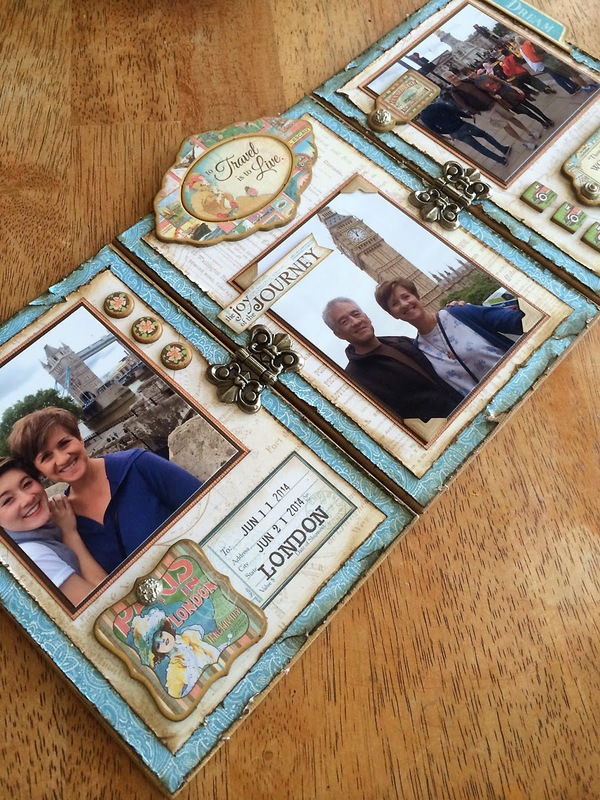 My Scrapbook Adhesives featured project is a Photo Triptych Display from our family trip. How fun it was to create this display of our favorite photos from our recent London vacation in this triptych-style decor piece! 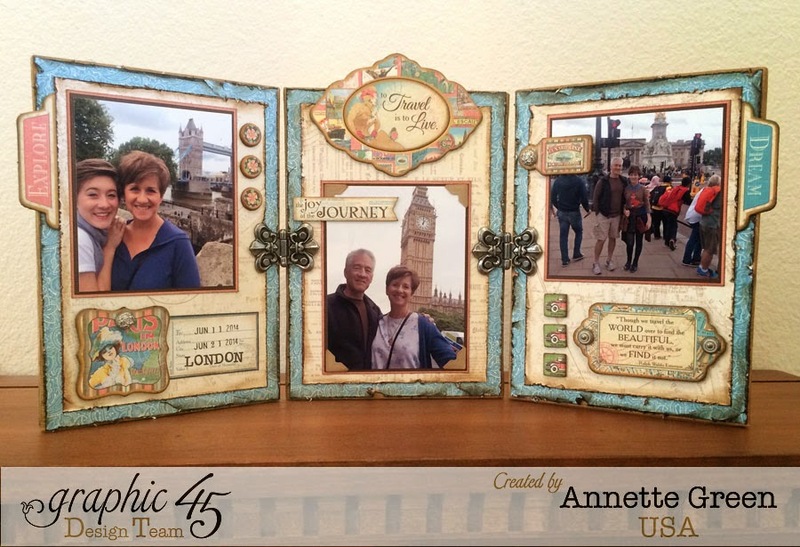 Made from three 5” x 7” flat canvases and the Come Away With Me collection of 8” x 8” papers and the Chipboard 2 pack, this was the perfect Graphic 45 collection for our travel photos. Plus it was fun, easy and quick to pull together in an afternoon with the help of Scrapbook Adhesives products. You can check out more photos below the supply list, plus my Snapguide tutorial which takes you step-by-step so you can make your own. Check out How to Create a Photo Triptych Display by Annette Green on Snapguide. I'd love to know how you like the project, so be sure to leave a comment. Then hop along through the other fantastic designers to see what they've created next! Great Idea and I love the color combo. That is stunning, That could be a great mantel piece!! great project, love the idea. Annette this is beautiful. This is definitely a show piece for your home. The Come Away With Me collection was perfect to display photos from your fantastic vacation. I love this project - everything so beautifully balanced and thought out! Wishing you a happy day! Great project! Looks like you had a fabulous vacation! Never tried that type of project. May have to give it a go. Very Pretty Annette, that will be a keeper for sure! Thanks Brenda. The tutorial is in the Snapguide. Simply scroll through for step by step instruction. LOVE your triptych! So pretty! I am going to have to follow your guide and try to create one myself! TFS! Loved the how to guide! Love this project. The tattered paper edges is perfect. I'm New to Scrapbooking....loving all these projects! Wow,Annette, excellent frame! So glad that you did a lesson on creating it! What a beautiful display! Thanks for sharing! Beautiful, I'm going to make this to display I'm home...thanks for the inspiration! I never thought of making a triptych! Thanks for the idea! :) It's beautiful! Fabulous idea...I can't wait to try this. Thanks for sharing. Love this! And thanks so much for the tutorial, a nice easy project with tons of impact! Lovely triptych Annette -full of ideas as ever! I loved this project because it was simple, yet beautiful. pinned it also. Oh, this just blew me away. I have been wanting to make something special for my parents' anniversary and something like this may be just what I need. Beautiful. I tried to pin it but all I kept getting was an about page. Oh well ... I tried. This is a gorgeous display to commemorate a trip. Thank you so much for the wonderful creation! Love to travel too! at least on a blog hop!!! LOL!!! beautiful! FAbulous way to remember a trip. What a wonderful display. Love the tutorial on creating the triptych. Love it. Great work. Beautiful! I love all the things you do for Graphic 45! This blog hop is fun as well! This us truly beautiful and something to treasure! Your tryptich is just fab!! Love that your project will be on view and admired!! Really nice! I haven't seen those bindings before, they class it up for such a great adventure! Love this paper. Interesting project. What a wonderful way to display those beautiful pictures. Thanks for the inspiration! Thanks for the tutorial of this project. I have a couple of photos of our family German Shepherd who died of cancer quite a while ago and this project would be great to use for them. I might make it to give to my Mum. thanks again it's a gorgeous idea. I really like this. I just got my Come away with me paper. I cant wait to use it. This is beautiful, thanks for sharing, my mom would love something like this, thanks for the inspiration. Love your project! Thanks so much. Fabulous photo display. Thank you for the inspiration. This is truly lovely. Love all the photos-looks like a fabulous trip. You created the perfect album to showcase it. Love the tutorial. It was very clear and easy to follow. It would look lovely anywhere in my home. 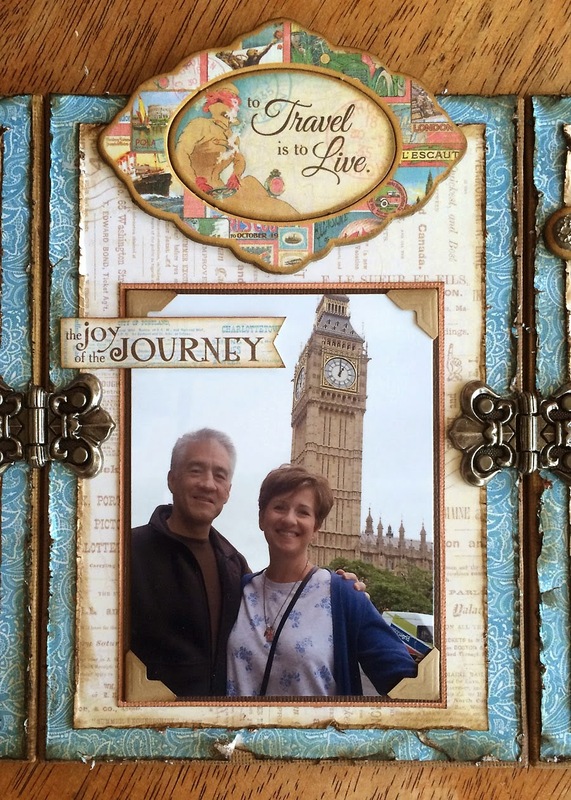 Annette, I love your travel album, so clean with a lot of detail and fun embellies. BEAUTIFUL!!! Soooo beautiful!!! What a lovely way to keep enjoying your trip! Love the distressing and the metal. Oh wow, I love this, I love the papers and the hardware, just gorgeous! 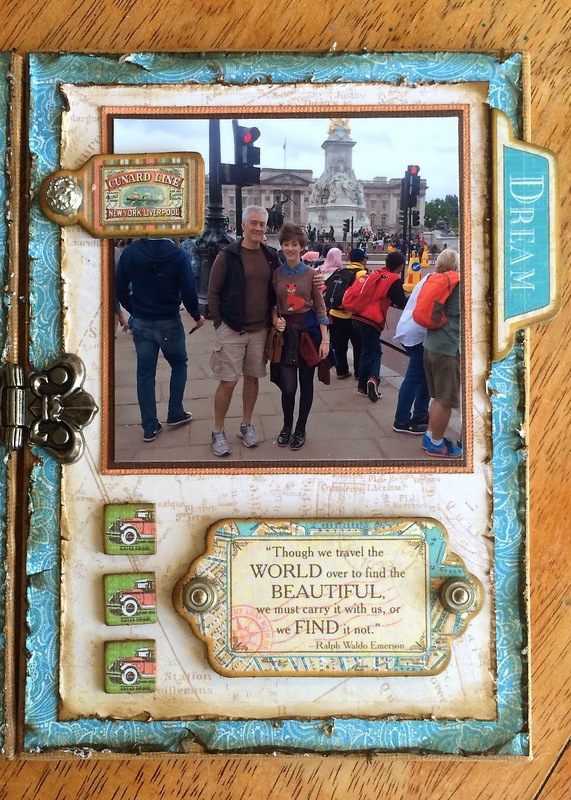 Thank you for sharing your lovely idea to scrapbook what must have been a wonderful vacation. It looks like you had a fabulous vacation. Thanks for sharing your photos with all of us. Lovely keepsake using gorgeous papers. What a perfect way to remember your(very recent!) travels. I love how you really distressed the edges, Annette...and seeing how much your beautiful teen daughter looks like your handsom husband! I love your photo display its such an amazing idea. I love the Come Away with Me collection it's fabulous to show off you adventures! So pretty Annette. Thanks for sharing. WOW! What a fabulous remembrance of your London vacation. Inspiring! Definitely to be treasured! I love this display.....I also enjoyed going on the trip with you through your photos. Thanks for sharing. I love everything you create! This is a great idea for a home decor piece! Great job Annette! Lovely! You've started the week with style and beauty! I love the whole idea of creating this to resemble a passport....beautiful project! 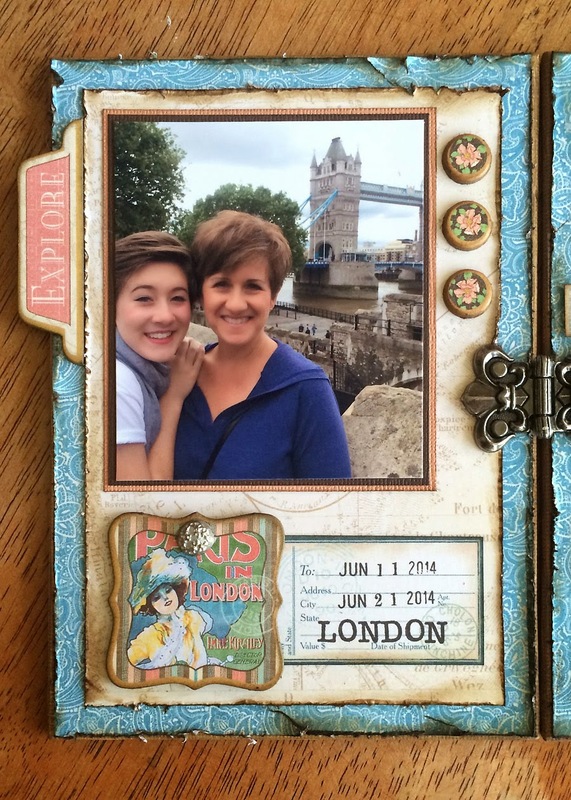 What perfect timing to create this project based on your trip to London. Everything you create is exceptional. Beautiful. A great piece to display and to remember a great trip. What a clever idea. I like how you have pieces coming off the canvas. That seems to pull my eye in to the photos. Thanks for sharing. Hello, dahlink! I saw this on FB yesterday but did not get a chance to visit. I love it! And now I am super mad that I did not buy the chippies to match this collection! You did a fantastic job! Very nice. Love all the texture you've added. Thanks for sharing the instructions on SnapGuide! love this Project. Sure will try. Thank you for Lovely inspiration. Looks like you had fun on your trip. What a great way to keep the memories alive! Annette this is fabulous, love all your G45 Staple's and Tim Holtz hinges; your tutorial is awesdome; I'm ready to Come Away With you !! :) Love how you did your layers ! What a great project! A wonderful way to display keepsakes of a special event. This would be a pretty way to display wedding Photos invitation, etc. TFS! Love the color combo of your project. Annette - all i can say is WOW!! I just love your tryptic, hope it's spelled correctly! I hope to make one for myself after your motivating pictures and Snapguide. Thanks!!!!! What a beautiul way to remember your family vacation. Perfect. This collection is beautiful with your pictures - super project! so gorgeous,thanks for the tutorial. Great project, would look perfect sitting on a side table. what an inspiration!! thanks for the tutorial! Great tutorial and like your layout and project. Love the triptych. Great way to display special photos! OMG!! I love this! SOOOOO beautiful!! Thanks for sharing! Your project is stunning! But it was even more amazing in the close up photos by seeing all the small details you added to enrich the project! What a great way to document your trip...so pretty! I found your blog when you posted your Seaside Album on the CTMH Artwork board. I love this 3 panel decor item! I love your little quick tutorial. I'm going to have to look into that for my own tutorials! I guess I learned a lot today from just one little stop! thank you. Annette - love the snapguide tutorial! You are a gifted artist and teacher and I'm blessed to know you. Hope you have a blessed and happy day! ~Debbie T.